On Thursday January 26, 2017 there will be a joint meeting of the five NWO-BwN projects: EMERGO, BE SAFE, Smart Ecosystems, CoCoChannel and Rebuilding barrier islands. Knowledge gain within these projects is not only important from a scientific point of view, but also forms the foundation for policy and future delta and river developments. The aim of this day is to inform each other and strengthen the interaction with our consortium partners, especially the NGO’s. Please go to our events page to find more information on the programme and the venue. You can register for this day by following this link. On 10 January 2017, 13.00-17.00 hr, the second Christiaan Brunings Lecture will be held at the Utrecht University Library Uithof (Boothzaal). This year's theme is salt marshes! 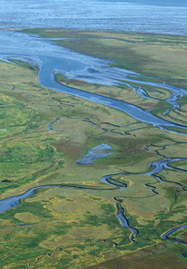 100 seats available (admission free) for practitioners and scientists working on salt marshes. More info (programme, abstracts) and registration at www.uu.nl/bruningslecture. Last year's lecture is online. Also see www.uu.nl/metronome. NCK-member Bas Borsje is one of the 25 nominees for the title 'New Scientist Science Talent 2016', a competition for the best science talent in Netherlands and Flanders! Bas focusses on coastal protection by soft/natural structures like salt marshes and mangrove forests and he investigates the load by tides and waves on those soft structures. This structures are cheaper and more climate proof than traditional coastal protection measures like dams and dikes. To receive the title 'New Scientist Science Talent 2016', which is an big honour, Bas needs to collect votes. If you like to support Bas, please vote for him at the website of the New Scientist!